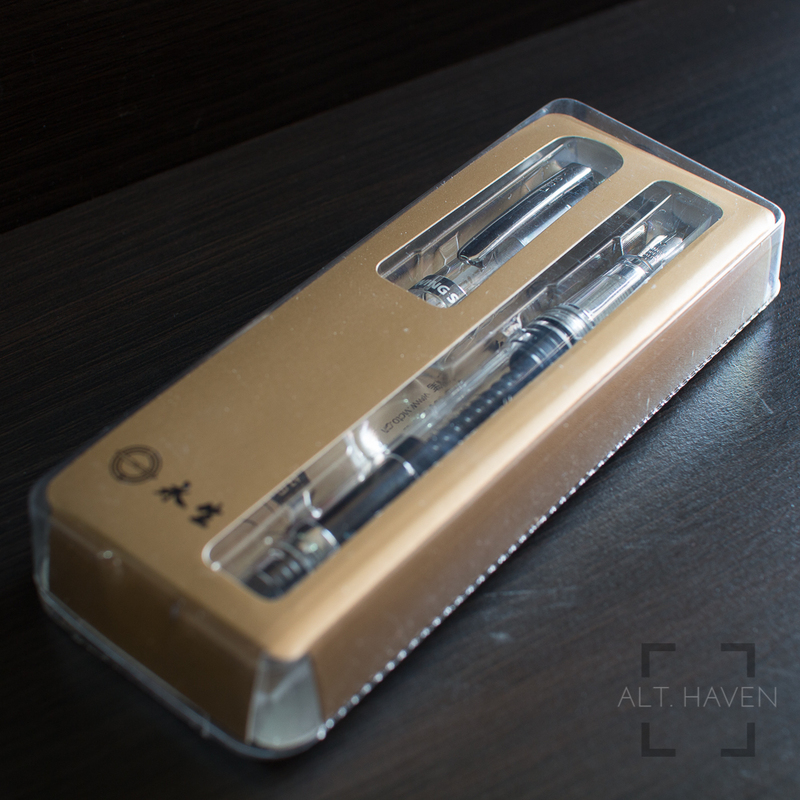 My thanks to Sunny of Straits Pen for providing this pen for review. Look out for more details below to find out how to win this pen. The Wing Sung 698 is a China made piston filling fountain pen. As far as I can tell it only comes as a demonstrator. It is a no frills fountain pen that does what it is made for. The pen is well balanced and it is sufficiently long enough for me to use without posting. However you can still post the cap if you prefer that. The Wing Sung 698 comes in a plastic blister pack that reminds me of the Pilot Kakuno. In fact I’ll say that the packaging is a direct copy. Inside you would find something that resembles a Lamy converter but don’t be fooled. It is actually a sealed tube of silicone grease. 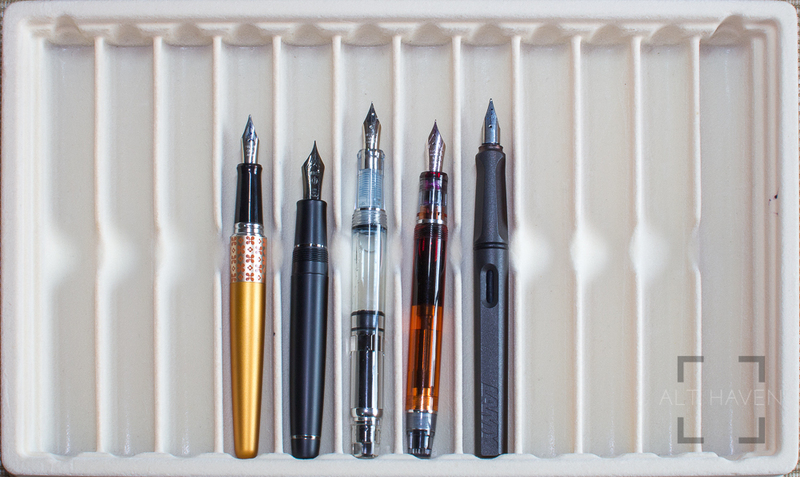 The Wing Sun 698 is not a small fountain pen. In terms of height, it is just slightly shorter than the Pilot Custom 823. However, the plastic body ensures the pen isn’t overly heavy. 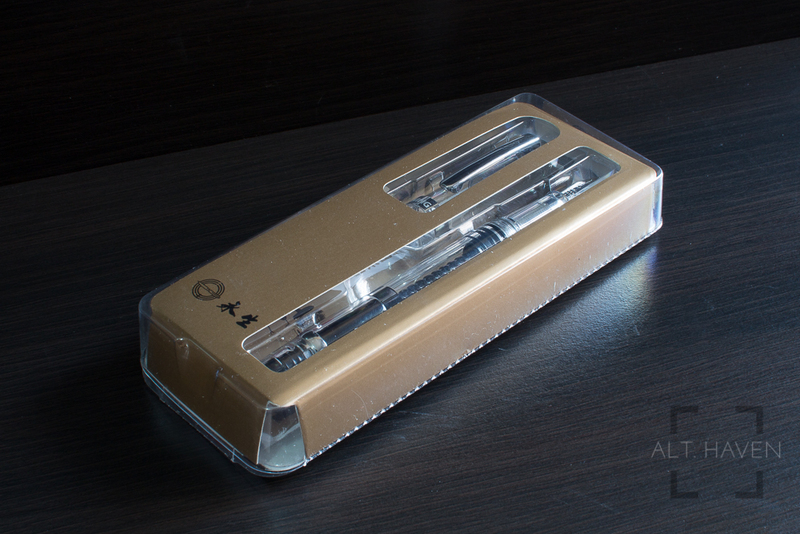 The clear plastic body is accented with silver finial, clip, centre band and piston ring. I like the clean cut look of the pen. 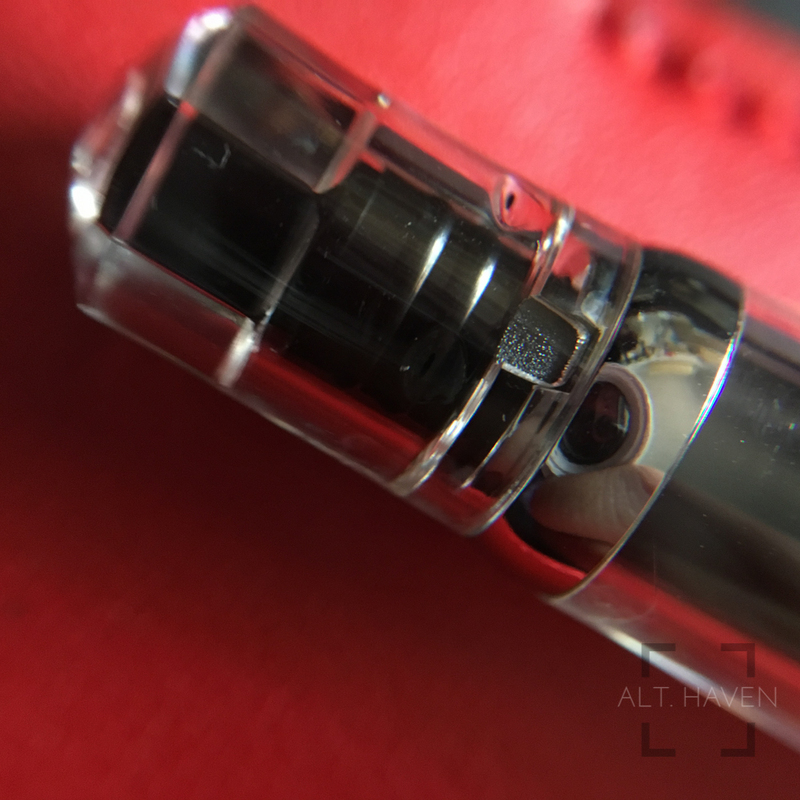 Looking at the way the pen looked, it was clearly made to compete against the TWSBI Eco. It looked similar to the Eco but not entirely copying it. That’s a plus right there. The cap takes only one revolution to uncap the pen. The clear cap makes it very very obvious if you splatter any ink inside the cap. So if you are bother by such things, it is best to avoid demonstrators in general. The clip is super stiff so it takes a little effort to slip it over thicker things. The finial is a silver sun burst pattern that I thought looked really nice. The grip section is narrower than I had expected given the size of the pen. The grip section is narrower than the barrel plus it tapers down towards the nib before ending with a slight flare. However, the grip section is long and could accommodate larger fingers than mine. My preferred grip for the Wing Sun 698 is right on the threads but they are nice and smooth so switching to a higher grip is no a problem as well. The Wing Sung 698 has a large ink capacity. After inking it up for at least 3 weeks I hardly made a dent in the ink sloshing inside the ink chamber. At first when I was trying to fill my pen I found I couldn’t twist the piston knob. For a while I wondered if my pen was faulty. Then, it turned out that the piston mechanism has a trick to it. It has a locking mechanism that prevents the piston knob turning by accident. All you have to do is to pull the piston knob. That will extend the piston knob slightly and then twisting it. The piston operates smoothly and without trouble once it is unlocked. I think this is an interesting design. I think it should be incorporated into more piston filler fountain pens. The Wing Sun 698 has a clear feed to match the clear barrel. It came with a stainless steel nib in EF. The nib is slightly on the drier side but not overly so. It writes smoothly and well. The ink flow kept up without any trouble. The nib is stiff and well suited to my writing style and quick notes taking. Also, the nib and feed is interchangable with the Pilot Kakuno, Metropolitan, MR and Prera but I've not tested it for myself. The Wing Sun 698 is an impressive piston filler fountain pen. 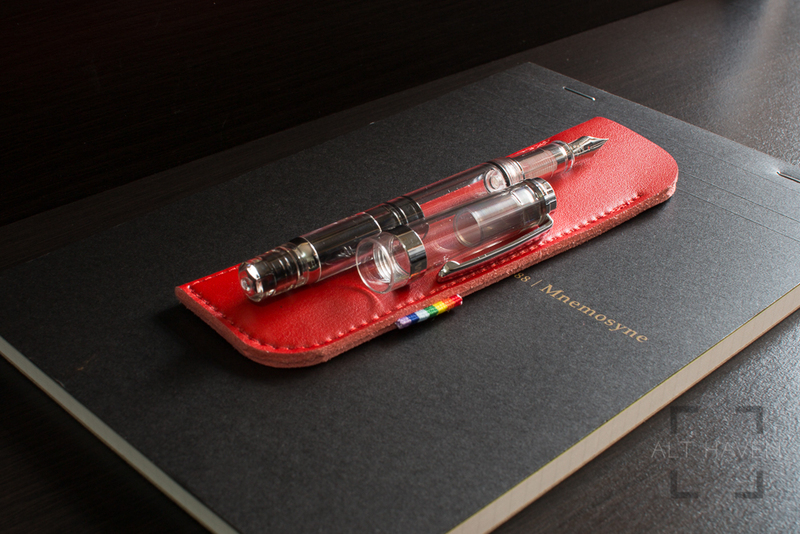 For it’s price and reliability it is a really contender against the TWSBI Eco. Pick one up and check it out for yourself. To have a chance to win this particular Wing Sun 698 fountain pen, please leave me a comment telling me what ink you would like to fill in a demonstrator pen. Please also include your email address so that I can contact you. I won’t be sharing your email with anyone else. It is collected only for the sole purpose to contact the winner. This giveaway is only open to anyone residing in Singapore. The giveaway has ended. The winner annoucement post is here.